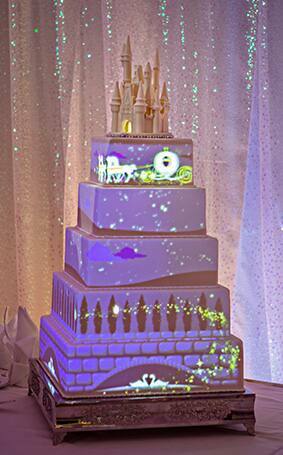 If you haven't already heard, here at Disney's Fairy Tale Weddings we are now projecting animation on wedding cakes! Bring your fairy tale story to life with fully customizable image mapping projection technology. 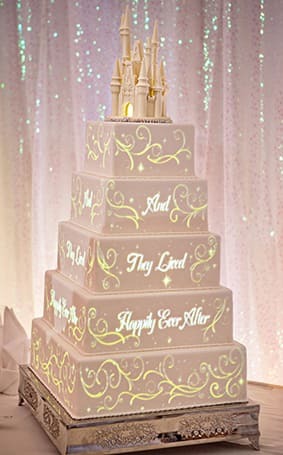 Transform your wedding cake into a photo slideshow, home video or add your favorite quote with a touch of Disney magic. A wedding cake never looked (and tasted) so sweet! For more information on wedding cake mapping be sure to visit our YouTube channel or chat with your Disney Wedding Planner. This is soooo cute! I wonder if they have a Little Mermaid cake like this!